It's (Sort of) a Snake! 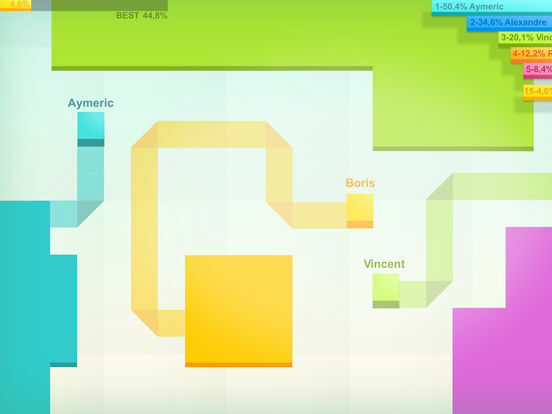 Paper.io is a weird online multiplayer game of sort of Snake, where you have to capture more and more territory by directing your constantly-moving square in order to trace out new chunks of whatever your chosen color is. The catch is that if another player runs over a line you're tracing (before it's completed), you're toast. So it's sort of like Snake, except running into other player's lines is a good thing. The be all and end all of Paper.io is expansion. Simple in theory, but made much more difficult in practice thanks to other players who are likely just as driven (and blood-thirsty) as you are. Start small. As soon as you spawn you'll be in motion, which can lead to immediate elimination if you aren't watching where you're going. Try to keep your first couple of paths small in order to give yourself time to get a feel for the area around you, and give surrounding players less opportunities to take you out. Watch your neighbors. It won't take long for you to start butting heads with other players. Try to keep your expansion to sides that only have one or two potential threats and don't make any big moves if you can see their square - because they'll likely move in for the kill as soon as you give them an opening. If you see another player's square heading in your direction, close up your path quick! They can't take you out if you don't give them the chance, and chasing you down could leave them vulnerable as well. Know your own limits. Things like running into your own path - as opposed to your more solid mass - and simply moving backwards will cause you to eliminate yourself (too easily, I think) if you aren't careful. Collect gems. Every time a player is take out, they'll leave a few of these gem-looking things behind. Collect them to give your score a little boost. You can change your controls in the options menu. If the swiping doesn't work for you, tap the gear icon on the title screen and then the finger icon. You can pick from swipe, virtual buttons on the left, or virtual buttons on the right. I'd recommend sticking with the swiping, honestly. 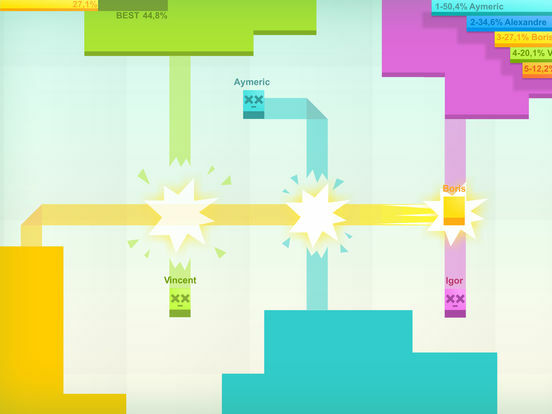 All of the .io games are essentially a simple game made more complicated by turning it into a multiplayer free-for-all. 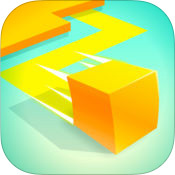 It's not a bad concept, really, but I feel it may have peaked with Slither.io, which was basically the game Snake with fewer movement constraints but also on a Massively Multiplayer scale. Paper.io is sort of like that, only it's not as fun. I don't entirely know what to call Paper.io. It's kind of like the classic game Snake, but not at the same time. Instead of trying to get longer and trap your opponents/get them to run into you, you're steering around a little square in order to trace out bigger and bigger borders for your central (and unmoving) mass. The conceit is that other players can cover up pieces of your mass by tracing their own borders across it, and if anyone (including you) touches the line you're tracing before you can close it off, you're eliminated. Plus it's got that Massively Multiplayer thing that all the other .io games like to do. The formula popularized by Agar.io - take a basic gameplay mechanic and turn it into a competitive online game - is still going strong because it still works. Mechanically, it's super easy to jump right in to Paper.io. You just swipe in a direction to move in that direction. That's it. No buttons, no power-ups, no skill progression - you move, and then move somewhere else. One of the twists that makes it tricky is the idea of expanding your territory. Every game begins with you holding a small bit of the map, and you have to expand by tracing out new areas and then closing them off by connecting the path to your central mass. You can take territory from other players by simply creating a path/shape over their own colored territories, or you can remove them entirely if you can manage to crash into the path they're tracing before they can close it off. When things are going well, Paper.io can be almost as entertaining as the other games. However, it's really, really easy for things to go completely off the rails in a hurry. Granted, these games are meant to be tough and keep you on your toes because of the randomness of playing with other people, but I've been eliminated immediately after starting a game more often than I think is okay. My chief complaint is that it's way too easy to accidentally off yourself. Once you learn what not to do you should be able to avoid things like running into your own path, though that is something I had to learn the hard way. During a good run, too. The thing is, if you move backwards you'll also eliminate yourself, because of course you're crossing over your path. This bugs me a LOT. Honestly, I don't think it should even be possible to move backwards, to say nothing of how each time this has actually happened to me I wasn't even trying to move in that direction but my swipe was misread. Not cool. Finally, there's the lack of a pause. Yes, this is an online game that's played simultaneously with a bunch of other people but that doesn't mean I have to like being forced to lose whenever the slightest real world distraction pops up. I don't have a solution to the problem; it just bugs me. Ultimately, Paper.io's frustrations outweighed my fun. The pause thing is just nitpicking, I freely admit that. However, the misread swipes really drag it down. Especially in conjunction with the way you can so easily eliminate yourself by accident. I wouldn't go as far as to call it 'bad,' but pretty much any other .io game is more fun (and less frustrating) to play.